Every day that Donald Trump doesn’t have 1,237 delegates brings Republicans one step closer to a contested convention in July, and the chatter is now turning to which candidate the GOP might draft last-minute if Trump can’t clear the threshold. Paul Ryan’s name frequently gets mentioned, as does Mitt Romney’s, but some are wondering if the former governor of Florida and would-be GOP front-runner might assume the mantle instead. 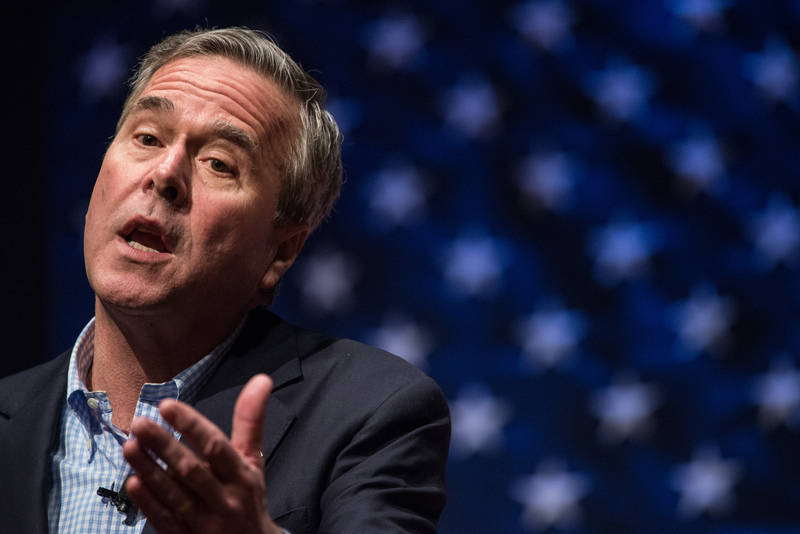 Could Jeb Bush get nominated at a brokered convention? Well, sure. All it takes to get nominated at a brokered convention is for a majority of delegates to cast their votes for you during the nomination process, and anybody is theoretically eligible to have their names thrown into the ring. Republicans could draft Phil Robertson if they wanted to. From a process standpoint, nothing is stopping the GOP from drafting Bush. There’s one small exception to this, though, and that’s the dreaded Rule 40. The Republican National Committee imposed this rule after the 2012 election,* and it requires all potential presidential candidates to win primaries or caucuses in at least eight states before being considered for the nomination. What’s more, they need to control a majority, not a plurality, of delegates from those states. Jeb doesn’t clear these requirements, and in theory, that would ban him from being drafted at a contested convention. However, Rule 40 can be changed or eliminated at the beginning of the 2016 convention if the RNC wants to. In fact, the RNC has wide latitude regarding almost all of its rules, because it is ultimately a private corporation that can govern itself as it wishes. So, from a rules standpoint, Jeb Bush —who did win four delegates dropping out of the race — could be drafted if Rule 40 was eliminated or changed at the start of the convention. The bigger question is: Would Republicans want to draft Jeb Bush? On the one hand, mainstream GOPers are currently in a hysteria about the prospects of Trump single-handedly destroying the party, and from that perspective, Bush is an appealing pick. He’s about as close to an anti-Trump candidate as you can get — respectful, policy-oriented, and with deep roots in the Republican Party. He also has a boatload of money behind him, which could come in handy in a general election. On the other hand, Bush proved one thing beyond a shadow of a doubt during his presidential run: Voters don’t like him. Despite having just about every conceivable advantage when he entered the race, Bush never really came close to breaking through, and his favorability ratings actually decreased steadily throughout the course of his campaign. And of course, nominating a dynastic candidate like Bush robs the GOP of that line of attack against Hillary Clinton in the general election. From a rules standpoint, the obstacles to drafting Bush at a convention are not significant. But from a political standpoint, the GOP might want to think twice before giving Jeb! another shot. *Interesting side note: The RNC created this rule to make it difficult for any potential insurgents to challenge Mitt Romney for the nomination in 2016, if Romney ended up winning in 2012 and running for reelection.